One of the newest direct-to-consumer luxury sheet companies in an increasingly crowded market, cloudten believes “It’s time to love your bed again.” They keep things simple, offering two types of sheets—their Amora Steen and Luna Percale sets—and additional pillowcases, all available in two colors, Smoke (dark gray) and Snow (bright white). No pillows, duvets or duvet covers, or fancy pajamas here. It’s just the sheets, plain and simple. But how does simplicity stack up against the competition? Keep reading to find out. For this review, I received one set each of cloudten’s Amora Sateen and Luna Percale sheets, in Smoke and Snow respectively. 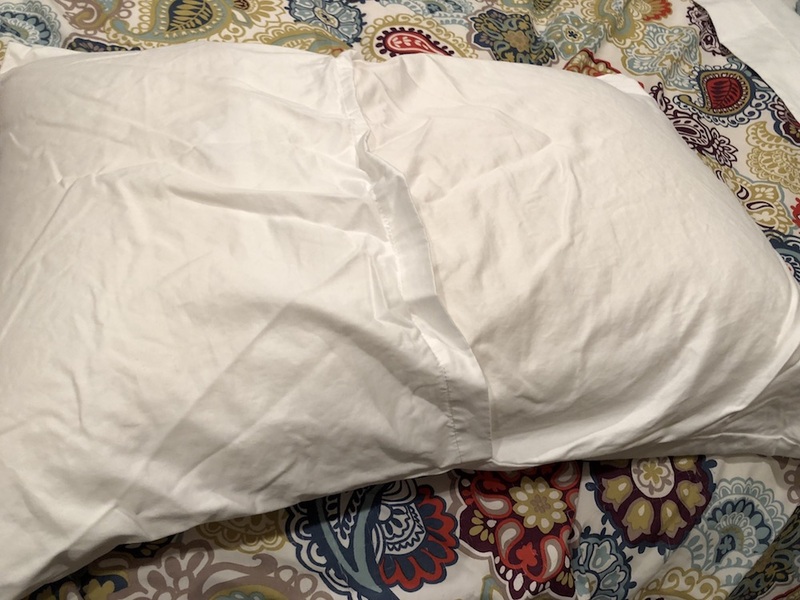 My husband and I each use two pillows when we sleep but we did not receive extra pillowcases, so we used pillowcases of our own on the bottom pillows (meaning we’d still be sleeping on cloudten’s offering. 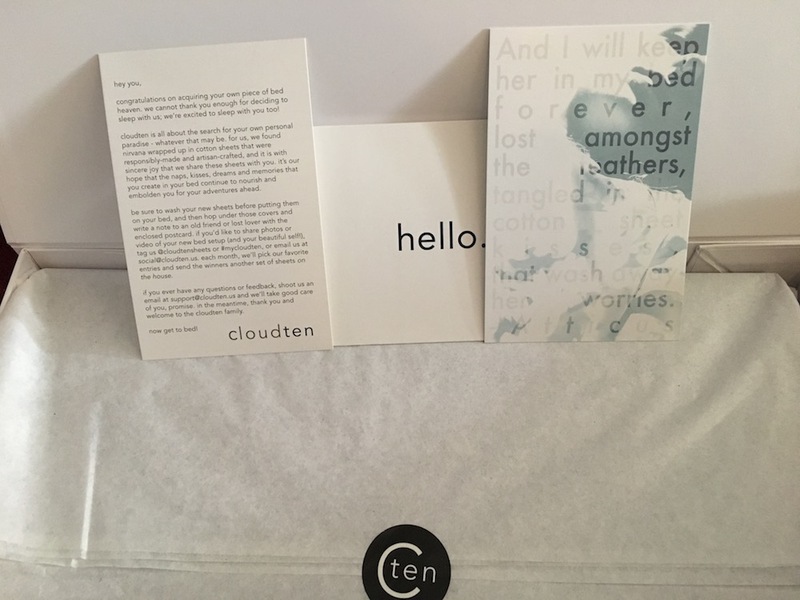 Cloudten’s sheets come wrapped in tissue paper and sealed with a branded sticker. An envelope bearing a friendly “hello” contans a postcard and a note giving more information about your new sheets. Cloudten’s sheets are simply but beautifully packaged in embossed white boxes whose lids hinge to open. The box is held shut by a cardboard band featuring a black-and-white photo of a woman peacefully sleeping in bed, presumably under the company’s linens. 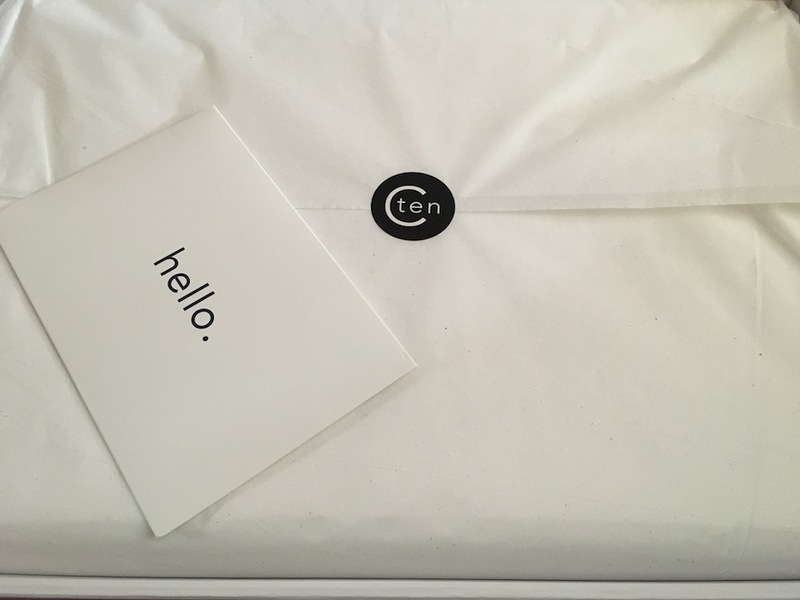 Inside the box, the sheets are wrapped in light tissue sealed with a sticker featuring the company’s logo, and an envelope printed with an inviting “hello” features a note to the buyer about the sheets that includes care and contact information, as well as (confusingly) a postcard for you to send … somewhere? Within the tissue, the linens are tightly folded and ready to be thrown in the washing machine. I tried out cloudten’s Amora Sateen sheets first. Their sateen finish was really beautiful in the Smoke color—it’s unusual for dark colored linens to shine this much. Because of the way they’re woven, sateen sheets are generally less breathable than percale, and I found this to be no different with the Amora sheets. On more than one occasion during our first trial run, I woke up and had to shift over in my bed because the sheets beneath me had gotten clammy from my sweating. And then it was time to try out the Luna Percale sheets. Percale sheets tend to be less soft than sateen right out of the package and then soften up over time, but these were remarkably soft from the get-go—so much so that I had to check and make sure they weren’t sateen. Due to a scheduling snafu, I washed the sheets a few weeks before I put them on the bed and kept them folded in my closet. I expected them to be extremely wrinkled upon removal but was pleased to see that they were hardly any more wrinkled than they would have been if I’d put the sheets on the bed right out of the dryer. That being said, when I put the fitted sheet on my mattress, I was disappointed to see a fingernail-sized snag close to the middle of the sheet. It wasn’t along a fold line so it’s unlikely that this happened while I was storing the sheets. Unfortunately, for all that cloudten emphasizes its rigorous quality testing, this sheet snuck through. Snag (that I hope won’t turn into a hole on subsequent washes) aside, sleeping in the Luna sheets felt lovely. They were crisp and cool and I never once woke up during this first trial because I was too warm—even the night I forgot to turn the thermostat down before bed. I was disappointed but not surprised—because this is a trend with luxury sheet companies—to see that both sheet sets feature sham-style pillowcases, meaning they open in the back instead of the side. 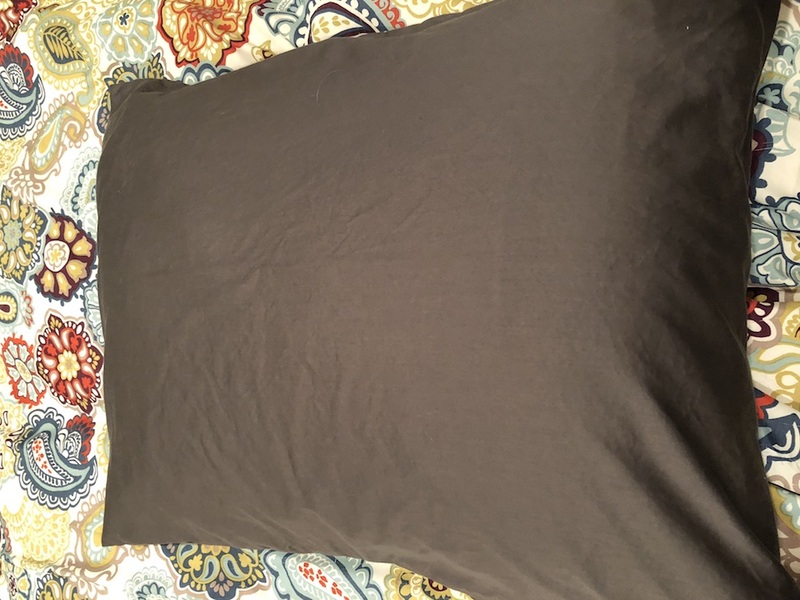 While this is aesthetically pleasing and makes for nice, neat corners, it also means that it’s not possible to flip the pillow over in the middle of the night if you need to (but it is possible to get your hand stuck in the opening in your sleep if you sleep with your arm under the pillow like I do.) Aesthetics asid, I’m really not sure why sheet manufacturers have decided that this is a desirable feature in their pillowcases. Cloudten’s pillowcases all have rear openings, making it impossible to flip the pillow over in the middle of the nice. The second go-round with the Amora Sateen sheets was really no different from the first. 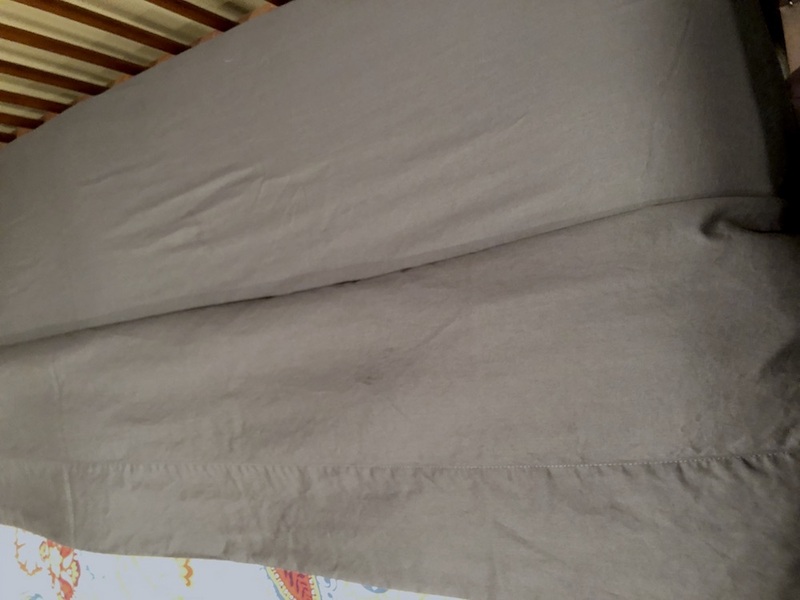 Although cloudten says its sheets improve over time, I didn’t notice a difference from one wash to the other. Maybe a few months in, I’d notice something but the change, if any, will be gradual. My second trial with the Amora sheets coincided with one of the nor’easters that hit my area recently, and I mention that to make clear that it was pretty cold outside while I had the Amora sheets on my bed—which is why it was surprising to me that, as the storm rolled in overnight, I had to turn my ceiling fan on in the middle of the night because I was so hot between the sheets, even though my furnace was not running. I’ve slept on many sets of sateen sheets over time and always found them to be a little warm in the winter, but in a cozy way; this set seemed to make me sleep even hotter than usual. The Luna sheets were, if possible, even more comfortable after the second wash than they were after the first. I was glad to see that the snag I found had not gotten any bigger during laundering, but I am a little worried that over time, this imperfection will become a big impediment to the longevity of these sheets. For now, at least, they’re soft, cool, and very cozy. But for that snag and the sheet size and pillowcase opening issues I mentioned above, they’re damn near perfect. Caring for the sheets: Cloudten’s care instructions are specific but straightforward. 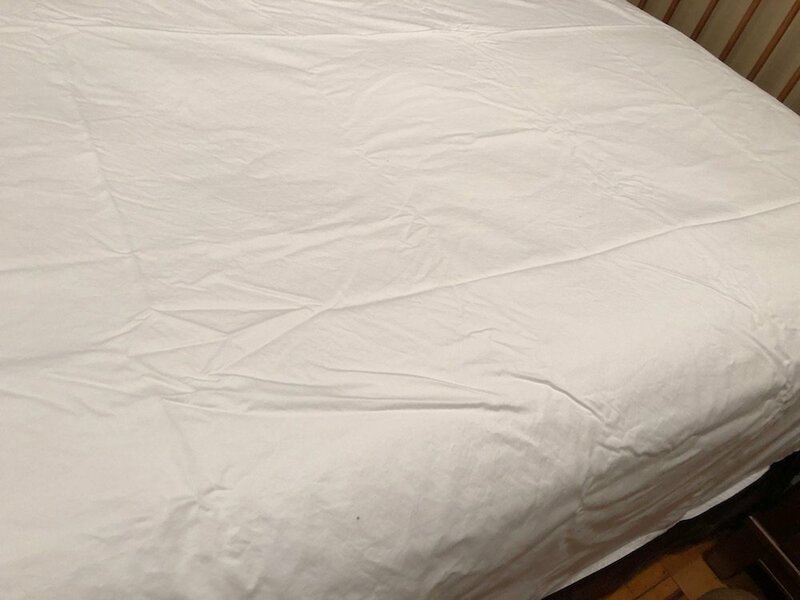 Nobody should have any trouble making sure that the Amora sheets remain in good condition. The wrinkle factor: Like most sateen sheets, wrinkling was minimal on the Amora sheets. Comfort from night one: The Amora Sateen sheets are soft and luxurious, if a little heavy, from the beginning. Comfort over several consecutive nights: There was no real change to comfort. The sheets stayed in place and did not slip while we slept. Changes with repeated washes: I didn’t notice any change from the first wash to the second, but cloudten claims that its sheets will continue to soften over time. Overall comfort: Great, especially if you like heavier sheets. Good for “hot sleepers”? If you turn into a human-shaped space heater while you sleep, like both my husband and I do, these may not be the sheets for you. The flip side, though, is that if you tend to be cold when you sleep you might really enjoy the extra warmth. Value: One of cloudten’s key differentiators on the market is that they charge a flat rate for their sheet sets, regardless of size. So while the sheets might be a little on the pricier end for twin-sized beds, they’re remarkably affordable if you’re trying to outfit a king. Caring for the sheets: Cloudten’s care instructions are specific but straightforward. Nobody should have any trouble making sure that the Luna sheets remain in good condition. 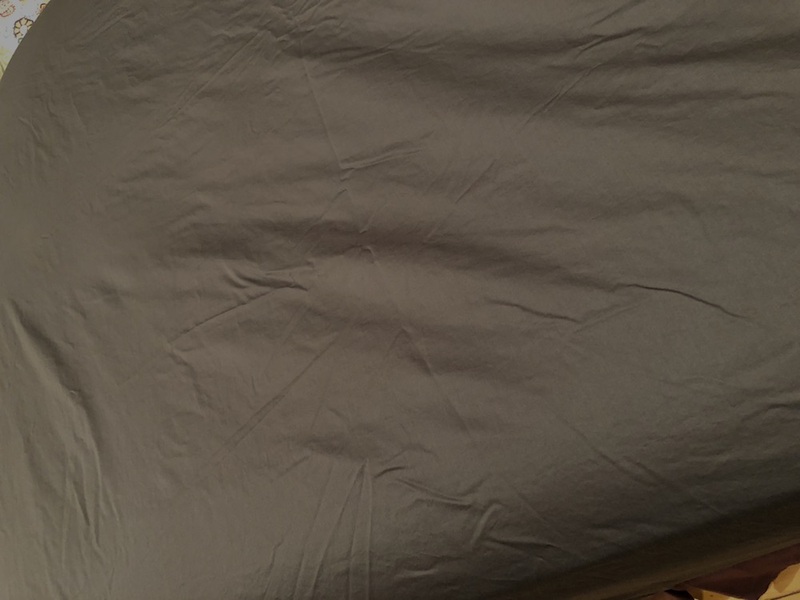 The wrinkle factor: These are percale sheets and percale sheets wrinkle. That being said, I was surprised that after a few weeks in the linen closet, they weren’t much more rumpled than they had been coming out of the dryer. Comfort from night one: The Luna sheets felt amazing to slip between from the beginning, even though percale generally needs time to soften up. Comfort over several consecutive nights: The sheets stayed in place and comfortable night after night. Changes with repeated washes: The Luna sheets got even more comfortable, somehow, after the second wash. I was also happy to see that the imperfection I noticed in the fitted sheet didn’t become a hole in the wash.
Good for “hot sleepers”? Yes! So much so that I was even a little chilly while I slept one particularly cold night. Established in 2017, cloudten is one of the latest entries in the direct-to-consumer luxury sheet market. Operating on the belief that everyone deserves “bed heaven,” cloudten offers consumers a 100-night trial on its 100% natural, chemical-free bedding. Returned sheets, as well as those deemed unacceptable for sale during the company’s rigorous testing process, are donated to those in need. 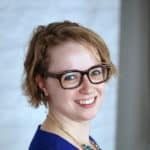 The company furthers this commitment to doing good by also donating a portion of each sale to Project Linus, a nonprofit that provides handmade blankets to children who are seriously ill.
Cloudten recently announced a partnership with Futurepay that would make its sheets more accessible to any shopper who can’t afford the cost of luxury bedding. Buyers can pay for the sheets in installments and will be responsible for a monthly service fee, instead of being charged interest. Thread count: Cloudten does not reveal its threadcount. Extras available: Additional pillowcases may be ordered through cloudten at the time of purchase or a later date. Care instructions: Machine wash cool using a mild laundry detergent. Tumble dry on low heat. Do not use fabric softener. Return policy: Cloudten offers a no-questions-asked 100 night satisfaction guarantee. Customers who dislike their sheets can send them back to the company. Cloudten has a lot going for it. A competitive spirit in a crowded industry, a commitment to social good, and quality products offered at extremely competitive prices. Though I didn’t sleep as comfortably in the Amora sheets as in the Luna sheets, both are clearly quality sets that lay solid ground for the company’s planned expansion into other sleep-related products.